Myth: The nuclear industry claims that nuclear energy is clean, reliable and cheap. Since climate change became an issue of public debate, it is also said to be climate friendly and sustainable. The nuclear industry points to expansion of nuclear power capacity in Eastern Europe to underpin its claim of a “nuclear renaissance”. 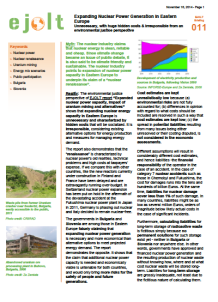 Reality: The environmental justice perspective of EJOLT report “Expanded nuclear power capacity, impact of uranium mining and alternatives” shows that expanding nuclear energy capacity in Eastern Europe is unnecessary and characterized by hidden costs that will be socialized. It is irresponsible, considering existing alternative options for energy production and measures for managing energy demand. The report also demonstrates that the “renaissance” is characterized by nuclear power’s old realities, technical problems and high costs at taxpayers’ expense. If we compare this with other countries, like the new reactors currently under construction in Finland and France have been delayed and are extravagantly running over-budget. In Switzerland nuclear power expansion has been put on hold in the aftermath of the devastating accident at the Fukushima nuclear power plant in Japan in 2011, Germany is phasing out nuclear and Italy decided to remain nuclear-free. The governments in Bulgaria and Slovenia are among those in Eastern Europe falsely claiming that expanding nuclear power generation is necessary and more economical than alternative options to meet projected energy demand. The report demonstrates the opposite. It shows that the claim that additional nuclear power capacity is needed and economically viable is untenable for both countries, and would only bring more risks for the safety of people and future generations.